If you are tired of seeing the common tourist attractions of the city and looking for a place to lie down and enjoy some peaceful time, come to Camp de Mar. Located in the extreme southwest of Balearic Islands and surrounded by high mountains, this beach is a must-place to stop by. 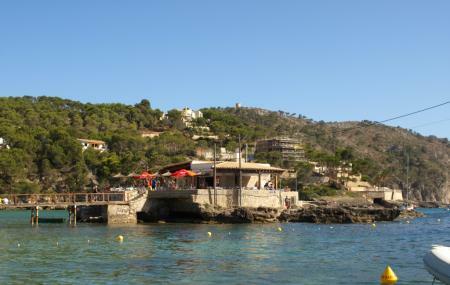 This beach is not so popular place but can serve you the best serene beauty of the beaches of Calvia. You can either come in the morning or in evening to watch the sunset. Lots of food eateries and small bars are located along the beach where you can fill up your appetite. However, the beach remains crowded during peak season. So if you wish to avoid the crowd, you need to learn about the off seasons first. The beach is crowded usually in peak season. It’s a nice place to spend quality time with family or friends . How popular is Camp De Mar? People normally club together Serra De Tramuntana and Playa Nudista El Mago while planning their visit to Camp De Mar. People also prefer to start their day with Camp De Mar.